“Way to make me bawl out loud–all alone–on a Saturday night! When something evokes emotion in this old Norwegian Lutheran body, you know you have something that hits close to the heart. This is an absolutely beautiful, touching documentary.” An email from Suzann Nelson to the producer of the video. It is apparent that this video was not made by someone simply assigned a job. . . and it wasn’t. Mark Brodin, producer and director, is a former member of the Delafield Evangelical Lutheran Church (and current sound engineer for Church Basement Ladies.) Brodin’s concern and love for the people of the area come through clearly in this wonderful, but sad, story that centers on the parallel between the changing farm economy and the decline of the Delafield Church’s population. 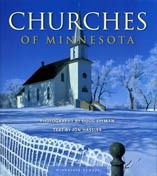 Founded in the 1870s by Norwegian immigrant farmers who were seeking to raise crops, families and community, they placed their most loved building in their most loved spot–a church in the middle of a cornfield. For the next 125 years, Delafield provided spiritual and social sustenance and continuity to subsequent generations. That continuity was broken in 1998 when the small congregation decided to disband and give away their beloved building. Although this story takes place in southwestern Minnesota, it is relevant to rural areas throughout the Midwest, and viewers unfamiliar with this geographic region will recognize the pain and struggle of the dwindling membership as the people face the hard reality of change. This video, which aired on many public television stations in 2002, would be a great gift for anyone who grew up in rural areas, and a wonderful donation to church libraries.